Kampnagel is connected to the public transport (HVV) by the bus stop Jarrestraße (Kampnagel)“. The bus lines 172 and 173 will bring you to the subway station “Mundsburg” (U3 line) or train station “Barmbek” (S 1/U 3). A 10 minute walk from Kampnagel brings you to underground stations “Saarlandstraße” or “Borgweg” (U3 line). 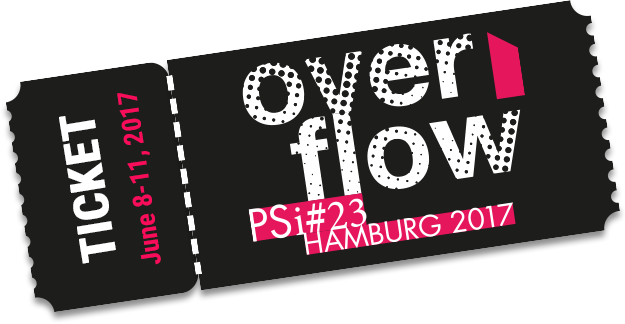 You get your conference ticket and bag at the OverFlow-check-in counter in the entrance hall at Kampnagel. Please bring the confirmation of your payment. Without any confirmation, you won’t get your conference ticket. If you have a conference pass for the whole conference, you don’t have to pay extra for the keynote lectures. For everybody who is already in Hamburg on Wednesday June 7th, there will be an Early Bird registration from 5.00 p.m. – 9.00 p.m. at the check-in counter at the entrance hall at Kampnagel. All presentations and video-material will be played on the technical set-up installed in all rooms. All notebooks run on Microsoft Office and videos will be shown on VLC player. There will be technical support for your assistance in each conference space. Please keep in mind that you will not be able to use your own laptops or other technical equipment for your presentation. In case you have not been able to send us your presentation material yet, please hand over a copy at the OverFlow-check-in in the entrance hall on your arrival. You will be given a set of vouchers together with your conference ticket. The catering will be handed out in the entrance hall. Coffee and snacks will be available from 8 a.m. each day. Lunch will be served between 11.30 a.m. and 2.45 p.m. from Friday to Sunday. On Thursday, lunch will be served between 1.30 p.m. and 2.15 p.m. Ticket prices: single ticket: 3,20 € / day ticket: 7,60 € / weekly tickets 27,70 €. For further information, please check the HVV homepage or install the HVV App: http://www.hvv.de/en. Please notice that the “Theater der Welt” festival tickets include public transport (HVV) on the day of the event for a trip to the venue and back within the entire HVV-area (including use of the high-speed bus). We offer daycare for those how travel with babies on little children. Please contact as soon as possible at the check-in counter. Not all rooms have free accessibility. All rehearsal stages (rooms 6A, 6C, KX and 5th floor) are only accessible via stairs. If you need any assistance, please let us know. You can find us at the OverFlow-check-in. The PSi#23 OverFlow-conference takes place at Kampnagel, Jarrestraße 20, 22303 Hamburg.